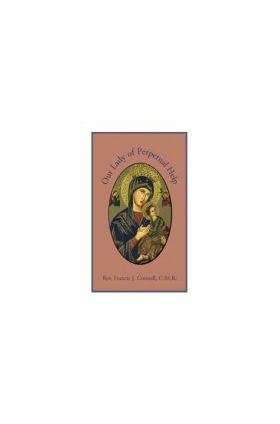 This beautiful history of the famous painting of Our Lady of Perpetual Help was translated from the original Italian by Fr. Francis J. Connell, C.SS.R. and originally published in 1940. Tradition holds that the original of this miraculous painting was created by Saint Luke the Evangelist (The original was destroyed by the Moslem invaders who conquered Constantinople in 1453. It had been venerated there since the 5th century.) and that the most famous copy of it is now in Rome. This is the story of that painting. Saint Luke was a physician of Antioch, who later became the companion of Saint Paul in his apostolic journeys and the author of one of the gospels. An ancient tradition informs us that Saint Luke was also an artist. According to the same tradition, he painted a picture of the Blessed Virgin, depicting her with the divine Child in her arms. We are not now concerned with the authenticity of this tradition. Suffice it to say that it is based on testimony dating from the fifth century. Moreover, arguments of intrinsic probability are not lacking, for it is certain that Saint Luke had frequent opportunities of seeing the Mother of God during her lifetime and of conversing with her, and that from her lips he heard the many details of our Savior's infancy that are recorded in the third Gospel. At any rate, it is an historical fact that a picture of the Blessed Virgin reputed to be the handiwork of Saint Luke was reverently preserved in Antioch during the first part of the fifth century. In the year 439 it was presented to the Empress Saint Pulcheria, who had a church built at Constantinople, her capital, in which the picture was exposed for public veneration. This famous painting was commonly known as the Hodegetria — from the Greek word signifying leader or guide. This title appears to have been derived from the section of Constantinople in which the church was situated and which was designated as the “Quarter of the Guides.” The Hodegetria soon became an object of the deepest veneration throughout the entire East, and especially in Constantinople. As centuries passed, it became customary, in times of public calamity, for both rulers and people to invoke the aid of Mary under this title, as being their heavenly guide. In the year 1204, Constantinople was captured by a great European army under the leadership of the Venetians. The conquerors found the precious picture, which had been hidden by the Greeks in the basilica of Saint Sophia, and transferred it to the Venetian church. However, in the year 1261, the Greek emperor, Michael Paleologus, recaptured Constantinople. Before entering the city, he gave orders to have the Hodegetria brought to him from the Venetian church. Then, while he entered his capital through the Golden Gate, he had the image carried before him, as his heavenly guide. Two centuries later, on May 30, 1453, the sad day dawned when the Turks, led by the Sultan Mohammed II, entered triumphantly into Constantinople. The savage soldiers rushed to the Monastery of Chora (in the western part of the city) where the sacred picture had been placed for greater security during the siege. Gaining possession of this treasure of Christian antiquity, they greedily despoiled it of the precious stones with which it had been adorned, and then tore the picture itself to pieces. On the spot where the sanctuary of the Hodegetria had stood, the Turks erected the Serraglio or Palace of the Sultans. Sad as was the fate of the venerable Hodegetria, yet it appeared to be a mani-festation of divine justice, punishing the Christians of the East for their rebellion against the pope, the Vicar of Christ. When God wishes to make known His displeasure toward a disobedient people, He usually rejects the sacred gifts they have presented to Him and sometimes allows even altars and consecrated images to be taken away or destroyed. Thus Constantinople was deprived of its famous picture of the Blessed Virgin styled the Nicopeia (Our Lady of Victory), which was carried away by the Venetians and placed in the Basilica of Saint Mark in their native city. So too, from the Eastern to the Western Church passed the Holy House of Loreto, the picture of Our Lady of Good Counsel, and (as we shall presently relate) that of Our Lady of Perpetual Help. It would seem as if Mary, Mother of Mercy though she is, was constrained to abandon a people who had become blinded and hardened by the constant abuse of the graces which God had bestowed on them in rich abundance. From a number of more or less faithful copies of the Hodegetria, made between the twelfth and the fourteenth centuries and still extant, a fairly adequate description of the original can be given. 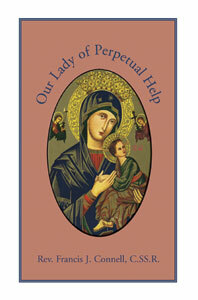 Our Blessed Lady was represented in half-figure, in the attitude of one standing. The head was erect, the face of a graceful oval shape, the eyes large, with the gaze directed out from the picture, the eyebrows beautifully arched, the nose straight and delicate, the mouth small, the fingers long and tapering. She was attired in a tunic that fitted closely around her neck, and a mantle that covered her head and draped her entire person, being gathered together over her bosom. A coif encircled her brow beneath the mantle, holding back her tresses. With her left arm she supported the divine Child, while her right arm rested on her breast. Her appearance was majestic, as was becoming to the Mother of God. The Infant was depicted with chubby face and a luxurious growth of hair, and with an expression of deep intelligence on His countenance. His garments were a mantle, and a tunic gathered at the waist with a sash. His right hand was raised as if imparting a blessing, while in His left hand He grasped a small roll of parchment. Sandals were fastened to His feet. We have deemed it necessary for the sake of our narrative to dwell at some length on the history and the description of Saint Luke's famous painting. For, as is very evident from the marked similarity between the two, the Hodegetria was the prototype of the picture of Our Lady of Perpetual Help and, accordingly, a knowledge of the former throws light on the origin and the significance of the latter. Rev. Francis J. Connell, C.SS.R.